How Do Intercontinental Ballistic Missiles Work? 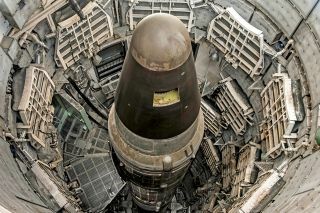 The Titan II intercontinental ballistic missile, which is housed at the Titan Missile Museum in Sahuarita, Arizona. This missile became operational in 1963 at the height of the Cold War with the Soviet Union and was de-activated in November 1982 because of a nuclear treaty. How do intercontinental ballistic missiles — including the one North Korea launched Tuesday (Nov. 28) that flew more than 10 times higher than the International Space Station — work? The answer depends on the type of intercontinental ballistic missile (ICBM), but most of these rockets launch from a device on the ground, travel into outer space and finally re-enter Earth's atmosphere, plummeting rapidly until they hit their target. An ICBM, as its name implies, can travel from one continent to another. Once launched, ICBMs travel in a parabola, much like a baseball flying through the air. Just like a baseball, an ICBM can be released at any angle. But in North Korea's case, the ICBMs are being launched "almost straight up," Coyle told Live Science. "They fly straight up against the force of gravity and come down some distance from North Korea … If they're long-range, [the North Koreans] usually drop them on the other side of Japan, which, of course, makes Japan very nervous." It's important to note that North Korea wouldn't aim its ICBMs straight up if it wanted to launch an actual attack. "They'd launch toward their target, which might be thousands of miles away," Coyle said. That means that even though the Hwasong-15, the latest ICBM, traveled about 620 miles (1,000 kilometers) from its launch site, it could travel much farther — likely more than 8,100 miles (13,000 km) from its launch site if it had a standard trajectory, according to a Nov. 28 blog written by missile expert David Wright. However, it's challenging to know how far a battle-ready North Korean ICBM would fly, as its "practice" ICBM likely had a light payload or none at all. Such a payload — like a nuclear warhead — would weigh down the ICBM and limit the distance it could travel, Coyle said. At takeoff, the ICBM enters the boost phase. During this phase, the rockets send the ICBM into the air, pushing it upward for about 2 to 5 minutes, until it reaches space, Coyle said. ICBMs can have up to three rocket stages. Each one is discarded (or ejected) after it burns out. In other words, after the first stage stops burning, rocket No. 2 takes over, and so on. Moreover, these rockets can have liquid or solid propellant. Liquid propellants "generally burn longer in the boost phase than solid-propellant rockets [do]," Coyle said. In contrast, solid propellants "provide their energy in a shorter amount of time and burn faster." Liquid and solid propellants can send rockets equally far, "but most countries start out with liquid propellant technology because it's well understood," Coyle said. "[As] they graduate, they move to solid propellant to get the faster burn times. It also avoids the hazards of dealing with dangerous liquids that are both flammable and toxic." In the second phase, the ICBM enters space as it continues on its ballistic trajectory. "It's flying through space very fast, maybe 15,000 mph or 17,000 mph [24,140 or 27,360 km/h]," Coyle said. "It's taking advantage of the fact that there's no air resistance out there." Some ICBMs have technology that allows them to take a star shot — that is, they can use the location of the stars to help them better orient toward their target, Coyle said. In the third phase, the ICBM re-enters the atmosphere and hits its target within minutes. If the ICBM has rocket thrusters, it might use them to better orient itself toward its target, Coyle said. However, because of the intense heat encountered when they re-enter the atmosphere, ICBMs can burn up and fall apart unless they have proper heat shields, Coyle noted. For the Hwasong-15, the entire trajectory took 54 minutes, significantly longer than North Korea's 37-minute test on July 4, 2017, and its 47-minute test on July 28, 2017, Wright wrote on his blog. However, although some countries have ICBMs — including the United States, Russia, China and India — none have fired them in a deliberate attack against another country, Coyle said. "We all have tested them to show we can do it, [which is] exactly what North Korea is doing now. [But] we've never actually used them in war, and the reason is it would be all-out nuclear war and we'd all be dead." You can read about the United States' defense against ICBMs and nuclear weapons in this Live Science article. Original article on Live Science.